"I stood in the middle of the room, unmoving – I barely breathed. My life had just become surreal, impossible, and one enormous lie. I needed to go, to run somewhere, anywhere to beat back the reality that was rapidly closing in around me. The image of him was burned into my retina, flashing over and over again like a warning. He was trapped somewhere between human and decidedly not, and I realized that was my new reality. I was too." I received a complimentary copy of Caged for the Blog Tour with Pure Textuality in exchange for an honest review. 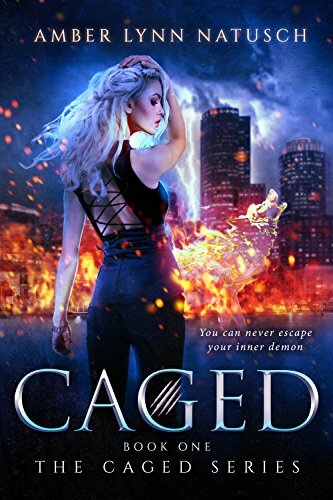 “Caged” is the first book in the Caged series by Amber Lynn Natusch, and it helped introduce the main character and her dilemma very well. Ruby has been through a lot. After losing her parents one horrible night, she’s trying to adapt well on her own. That terrible night also helped her gain her eyesight. She was blind for so many years that she never even knew what her parents looked like and didn’t have anything. She’s been having moments where she blacks out when she panics or is stressed out after since that night her parents were killed, but she has no idea what happens during the time she blacks out. She ends up meeting up with Sean, who she thinks is stalking her because he is always there. She also meets Erik, who she is fascinated with the minute she sees him. But…both guys have their agendas on why they want Ruby. Ruby ends up choosing between the two and ends up picking the wrong one now she is stuck in a jam…but in the meantime, she finds out exactly what is happening during the blackouts. At first, though, she does not believe it. She has to see the aftermath of the outages to understand what she indeed is and why certain kind of people want her. She also has to witness something that someone does in front her to believe that it is indeed true. My thoughts on the first book to the Caged series was that it was a delightful read. I loved how the author introduced the characters in the beginning and what happened to Ruby in the beginning. I was lost a little at first, but then I was able to follow the story more once I understood what happened to Ruby thoroughly later on in the book. This is an excellent book for the first to the series, and it explains what Ruby is very well. The only thing that bothered me was the main character sometimes. I did not click with her well. Maybe the way she always was getting frustrated and yelling at the other characters and perhaps the way she talked period. ( I did like the fact that the way for her to relieve stress was to dance and that is a great stress reliever ) One of my favorite parts was when Ruby, Sean, and Ruby’s friend Ronnie were at a store (which is the excerpt in the guest post/giveaway post above). Ronnie played a short role, but she put Ruby in her place. Sean was my favorite character in the story because of the way he was always there for Ruby. Even when I found out what he was, I still loved him because I knew in the end, he loved being around Ruby. Be prepared if you do read it, to have a lot of bad guys in the story.